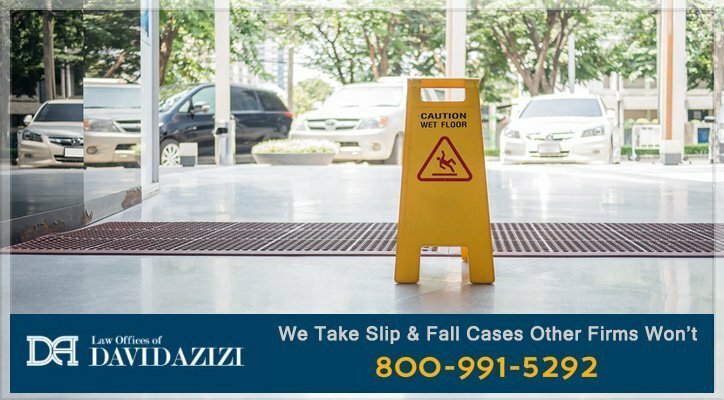 ✅ Trip, Slip & Fall Lawyer Los Angeles - Rated "Superb"
When you or someone close to you experiences a slip and fall accident, calling the Law Offices of David Azizi as soon as possible is important to collect the compensation you deserve. Set up a free consultation to review your case by calling (800) 991-5292. We are available 24 hours a day since accidents are not limited to the hours from 9:00 to 5:00. In addition, if you cannot come to see us, we can come to your hospital room or your home. Did you know that more than one million visits made to hospital emergency rooms annually are due to slip and falls accidents, according to a National Floor Safety Institute* report? That is roughly 12 percent of all fall-related ER visits. While most slip and fall accidents are not fatal, they represent the longest amount of time lost from work. In addition, the Consumer Product Safety Commission** reported that flooring accounts for over 2 million injuries per year due to falls. Falls are the leading cause of injuries and fatalities among those 65 or older, according to the Centers for Disease Control and Prevention. Did you know that more than one million visits made to hospital emergency rooms annually are due to slip and falls accidents, according to a National Floor Safety Institute report? That is roughly 12 percent of all fall-related ER visits. While most slip and fall accidents are not fatal, they represent the longest amount of time lost from work. In addition, the Consumer Product Safety Commission reported that flooring accounts for over 2 million injuries per year due to falls. Falls are the leading cause of injuries and fatalities among those 65 or older, according to the Centers for Disease Control and Prevention. The first determination you or others will make is whether you need to be taken to the E.R. by ambulance. For instance, if you hit your head and were unconscious for even a moment, emergency transport will undoubtedly be ordered. Report the accident to the manager or store owner. If you have a cell phone, take a picture of the reason you fell. This will help you document what happened. Capture whether signage or mats were present, warning of the slippery floor. Check to see if anyone witnessed your accident. Ask for the person’s name, phone number and address. Some witnesses may not have seen you fall but may be cognizant of your injuries. Get their information too. You will probably speak to several store employees. Get their names, positions in the store and ID numbers. If they wear a badge, the information should be displayed. You may be asked to fill out an incident report form. This is an excellent way to put down the facts of the accident. If you fill out an accident incident report, ask for a copy. Wait until it is finished and the manager/owner has filled out his or her section. Notice if a video camera was located near the accident site. Many stores have multiple cameras with 360-degree vision fixed on areas of the store. Take a picture of the video camera, and tell your attorney about it. He or she can use the footage to prove what you say is true. If you did not need to be transported to the hospital, visit your doctor as soon as possible. Sometimes the adrenalin pumping in your veins immediately after a slip and fall accident masks symptoms. Your doctor can make sure nothing is missed. In addition, the doctor’s notes document any injuries you may have. It is also a baseline for injuries such as cervical strain that may not be symptomatic for 24-48 hours. If your doctor prescribes rest or medication, make sure to follow his or her instructions. Don’t miss doctor appointments related to your injury. If your insurance company calls, don’t provide a statement if it is being recorded. This is not required, nor is it necessary for your case. Tell them your attorney, if you have one, will be speaking to them about your case. Physical evidence should be preserved. This means anything you were wearing when the accident happened. The clothes will show a pattern of injury, and if any substance was part of the reason you slipped, it will be on the clothes. Keep a diary of how you feel daily. It can take weeks or months for a lawsuit to process, and it is easy to forget details about how you felt. Maintain a file with all your medical bills, prescriptions, receipts and travel expenses. Don’t talk about the accident on social media or post details. To recover damages in a slip and fall accident, you must be able to prove slip and fall liability. Simply put, you must show the owner should have known the situation existed, did nothing about it or caused it. Since this is the backbone of a liability claim, take a deeper look at these parameters by visiting our proving liability page. How Long Do You Have to File a Slip and Fall Lawsuit in California? There are restrictions concerning the length of time you must file a claim if you were injured in a slip and fall accident. If you do not file in time, your case will not be heard. For most accidents, the statutes of limitation in California*** for injury to a person is two years. If the injury occurred in a government facility, the time limit is reduced to six months or 120 days. There may be extenuating circumstances that allow a claim to be made after the statute of limitations such as if a child is injured. This extends the time limit until two years after the child’s 18th birthday. No two accidents are the same. The way an injury affects an individual is different depending on the way the person fell (the trajectory) and the age, health and condition of the individual when the accident happened. The treatment protocol and the individual’s response may vary from one person to another, leading to a different recovery duration. The emotional effect of the accident varies. The time it takes to resolve a case is different from one case to another. In some, the insurer is willing to negotiate a fair settlement, and in others, the insurance company tries to severely underpay. In the latter situation, it may be necessary to take the case to court. Remember, once you settle a case, even for an inadequate amount, the insurer will ask that you sign a waiver saying you will no longer hold them liable for your injuries. Once you do that, what you receive from the insurance company is all you will get. This will prevent any further compensation even if you need further treatment. It is important to note that no one can foresee what will happen physically after a slip and fall accident. Sometimes, the extent of the injury does not show up for days or even months after the fall. The need for surgery is not always predictable at the time of the injury nor is the person’s response to treatment. Although it is human nature to want to put the entire thing behind you and move on, if you do that before everything is known, you may severely shortchange yourself. David will help you negotiate with the insurance company and provide answers as to what you can expect a settlement to be. If the case needs to be resolved in court, David will be at your side. To get a ballpark figure of what your case may be worth, use our Slip and Fall Settlement Calculator. Abrasions or cuts: These injuries are usually superficial. However, an abrasion or cut may be a warning of something more intense under the surface such as a hair-line fracture. When you arrive home, take a picture of any external signs of injury. Your doctor will document them in a report. Make sure to ask for a copy. Fractures: Landing hard on a floor can cause a sprained ankle or wrist or even a hip fracture, particularly among older people. The type of fracture can vary from a simple break to compound fractures, requiring multiple surgeries. Your doctor will order X-rays if there is any suspicion that you’ve suffered a fracture. Head injury: The CDC reports that head injuries commonly occur with slip, trips and falls. A head injury may result in concussion or traumatic brain injuries, causing swelling on the brain or a hematoma, which is bleeding inside the brain. Symptoms of a serious brain injury can be delayed, so being checked out by a physician is recommended. Soft Tissue Injury: An injury to soft tissue can be anything from a minor sprain/strain. Seeking medical care right away after a soft tissue injury is important since symptoms may not arise immediately. If they are not treated, soft tissue injuries can be a source of chronic pain or infection. Low Back Injury: Injuries to the lower back or lumbar spine can result in slipped discs, herniated disks or damaged vertebrae. This type of injury can cause pain and limit mobility, requiring long-term medical treatment. A spinal cord injury can cause permanent changes in sensation, bodily functions and strength. Cervical/Neck Injury: Cervical spine injuries can involve the muscles, ligaments and tendons. It can also result in herniated vertebral disks. Spinal injuries may require surgery, and often, rehabilitative therapy is needed. The expense can be a source of financial difficulty if damages are not recovered. Thoracic Spine Injury: Such injuries can result in vertebral fracture and arm weakness. In some cases, you will need bed rest to allow the injury to heal. This can have a serious effect on your income for the period. Shoulder Injury: A person who experiences a fall can cause a brachial plexus injury or suffer a dislocated shoulder. The brachial plexus is composed of nerves that connect your spinal cord to the rest of your arm and hand. A fall can stretch or tear the nerves, causing loss of feeling and difficulty using that arm or hand. Dental or Facial Trauma: Falling forward can loosen teeth or cause tooth loss. Dental care is often not covered by health insurance and can be expensive for people of all ages. A fractured jaw or nose can also happen. Slip and fall accidents are due to slick surfaces either on the floor or on stairways. But, slip and fall incidents can even happen when there’s no moisture involved. They can result from recently waxed floors, poor lighting, missing stair handrails and missing ramp traction guards. They can also occur at the entrance to a building during inclement weather if mats to prevent slippage are not used. David knows from experience that a high percentage of slip and fall accidents occur in one of the most common places – grocery stores! Whether it’s a Ralph’s, Vons, Northgate, 99 Ranch, Costco or even Walmart, every store that carries fresh produce has areas where floor moisture can easily accumulate. These stores also often have floral sections, where water dripping from plants can create slick floors. Of course, these businesses usually sell numerous liquids like milk, juice, soft drinks and alcohol, as well as more viscous liquids like shampoo and laundry detergent. Spills associated with any liquid create potential hazards, as does water tracked in by customers on rainy days – even in Southern California. The duty of care owed to the visitor is a high priority in commercial establishments since the owner expects to gain financially from the visit. Parking lots, associated with businesses, should offer the same level of safety. Potholes and crumbling pavement in the parking area are major problems for customers. Slips in indoor parking lots, are often caused by oil-slicked surfaces. In addition, if drainage grates are not installed, flooding or pooling of water can occur, leading to accidents. Slips and falls in restaurants are also common. Landlords/owners have a responsibility to renters to keep premises safe both indoors and outdoors. The landlord or owner can be held responsible if he or she had control over the safety infraction. If he or she could repair the problem and chooses not to do so, they may be considered negligent and liable for damages. A home owner also can be held responsible for injuries in or outside of the home. The liability here is less stringent. Read more on our liability in the home page. Government properties include federal, state and city/county facilities. There are differences in the level of responsibility. In addition. the time frame for filing a claim is much shorter. Learn more about slip and fall accidents in government buildings. Airport slip and falls are common since people are generally rushing and concentrating on finding their way through the airport. All airports, except one in this country, are owned by a government entity. 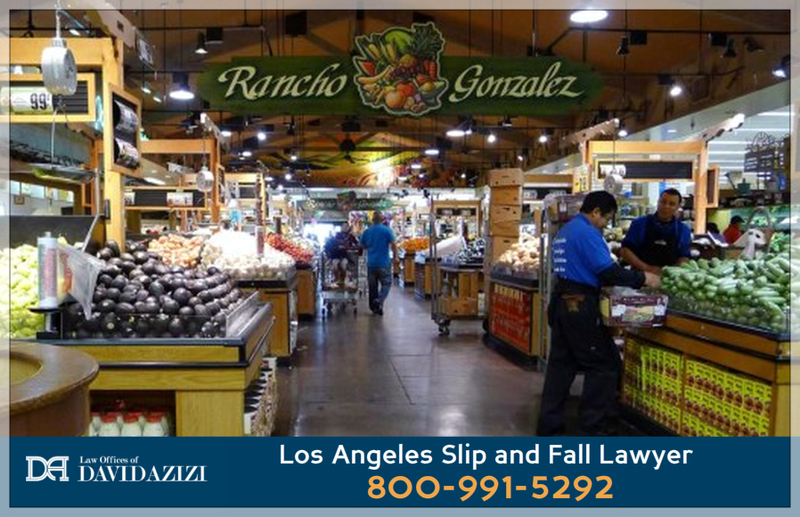 If you or someone you care about has been injured in a slip and fall accident due to a store owner’s negligence in the Los Angeles area, you may be entitled to monetary compensation. However, to recover damages, you need to be able to prove liability, and the services of a slip and fall attorney are invaluable. David Azizi has practiced personal injury law in California for over 21 years. He has won numerous settlements and verdicts for victims of slip and fall accidents. He spends time talking to his clients to establish the facts surrounding the accident. To better advocate for the people he represents, David uses experts in slip and fall to provide in-depth information and testimony. David’s tenacious pursuit of the reasons the accident happened and how it could have been averted if proper prevention and maintenance steps had been taken by the business owner, helps his clients win the compensation they need. David has been honored by Super Lawyers, who called him a top-rated personal injury attorney in Beverly Hills, California. Expertise.com identified David as one of the top 20 personal injury lawyers in Los Angeles. Such accolades are not given easily but rather reflect David’s life work. The Law Offices of David Azizi are available 24/7 to take your call, and set up a free, no-obligation case review. Just call 800-991-5292. David’s 98-percent success rate worked for others, and it will work for you. If there are slippery substances on the floor and there are no signs to mark that area as slippery when wet this is deemed as negligence. 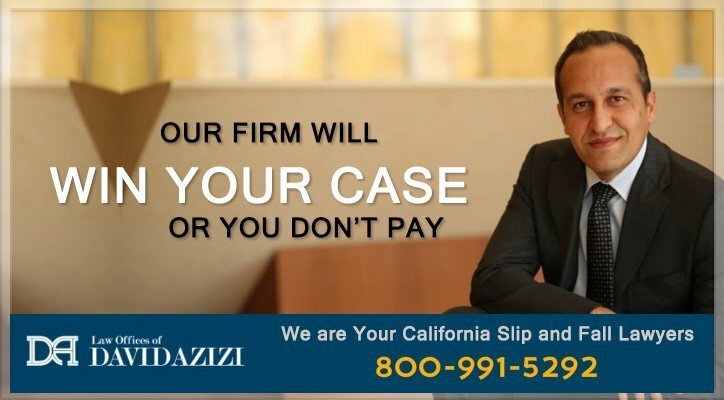 Remember that each case is different and it is best to contact the Law Offices of David Azizi if you have any questions as it relates to slip and fall or trip and fall accidents at the Los Angeles International Airport so David will be able to give you an honest opinion on the possibility of a personal injury claim. There are many times in which a personal injury claim is not the best option. If you have been injured in a slip, trip and fall accident, reach out to us at 800-991-5292 and we will set up a free consultation so you can speak with an experienced Los Angeles personal injury lawyer today.